How Far is Manbhum Around The Grove? Welcome to Manbhum Around The Grove developed by Manbhum Construction Company Private Limited in Hyderabad at Madhapur. Homes in Hyderabad where you can enjoy the view of nature and breath the fresh air where you will find the natural groove around you in the heart of the Hi-tech city, each home has its own mini-groove in the balcony with planted trees in the planter boxes. Spaces which makes you forget about the world and just wants to keep you happy away from worries where you can enjoy your life with your loved ones. You can find neem, Kala Jamun, teak, Millingtonia, Cotton and more trees around you. 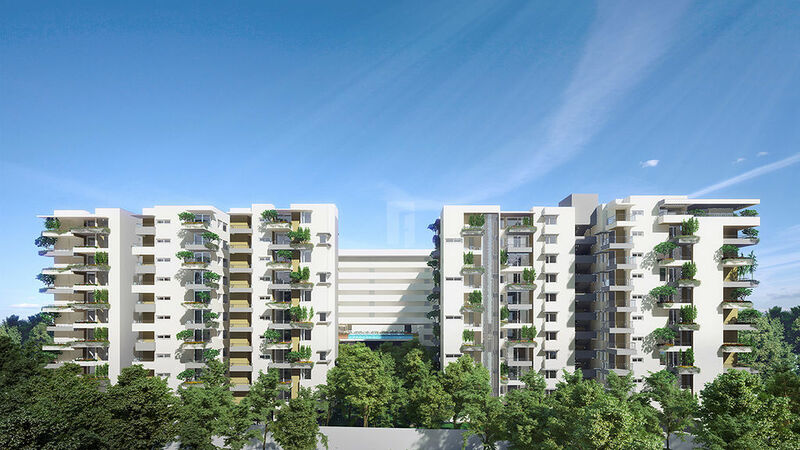 The project offers the apartment for sale in Madhapur at Hyderabad, where 3BHK flats super built-up area size varies from 1835 Sq ft to 2300 Sq ft and 4BHK flats super built-up area is 2860 Sq ft, 2965 Sq ft. Houses where you can breathe fresh air, sensibly designed to provide a comfortable lifestyle. spacious kitchen, utility area and bedrooms, and homes with defined private and public spaces. Being located at one of the ideal locations for finding homes in Hyderabad, situated precociously at the heart of the Hi-tech city which has prime work locations and daily needs in the proximity. Locality is loaded with social infrastructures and entertainment zones and more. The project offers amazing amenities some of them are a full-size badminton court, games room, mini-theatre, gym, infinity pool, walking and jogging tracks and banquet hall.